Paperboy Nintendo 64 N64 Authentic OEM Video Game Cart Rare Bicycle Retro GOOD! 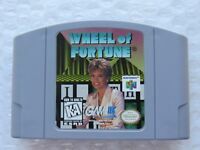 Wheel of Fortune Nintendo 64 N64 Authentic Trivia Video Game OEM Rare HTF GREAT! 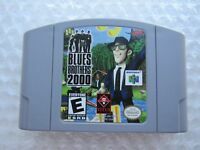 Authentic Conker's Bad Fur Day OEM Nintendo 64 N64 Video Game Cart Rare GOOD! Get off the road, I'm driving!!!! Well, the game works fine, but it sometimes gets glitchy. Such as it suddenly having weird sound effects and stuff that aren't meant to happen. I'm prob not explaining it correctly but it's really f'ed up. anyway, the game is fun, but has sound glitches. It also sometimes the game freezes. But hey, it's a f'ing n64 game, it's expected to do all those things listed above. Also, i got no idea how to delete old files, so i'll have to look that one up. Anyhow, this game was fun and is a great party game. CRUIS´N EXOTICA, N64 -version review. You're gonna love it. Fast fun arcade racer with unique tracks. Best Cruis'n game there is. Dinosaurs, cool cars, flips, and more. I love the Midway games on the N64 and this one is a great arcade racing experience. If you are a fan of the RUSH series or Cruis'n USA - Cruis'n World then you will enjoy this game a lot.